Oh! how my hear ached for some Carrot Muffins! It was the officially the fist day of Fall and there was a nip in the air. The dew drops on the grass shone like tiny jewels in the morning sun. I could already smell the Cinnamon and maybe a little Ginger. Every time I inhaled the dew laced morning air, my heart pined for some warm Carrot Muffins. But errands had to be run and chores need to be completed. The Carrot Muffins had to wait. Can they really wait? When the air outside is smells of Cinnamon??? So I took out my food processor, measured my rolled oats and almonds and pulsed them into fine flours. Yes! I make my own Oat and Almond Flour, and you should do it too. 2. It is ridiculously simple to make them at home. I am not gluten intolerant, and thankfully neither is Sam or Sid. But I love using alternative flours while baking. 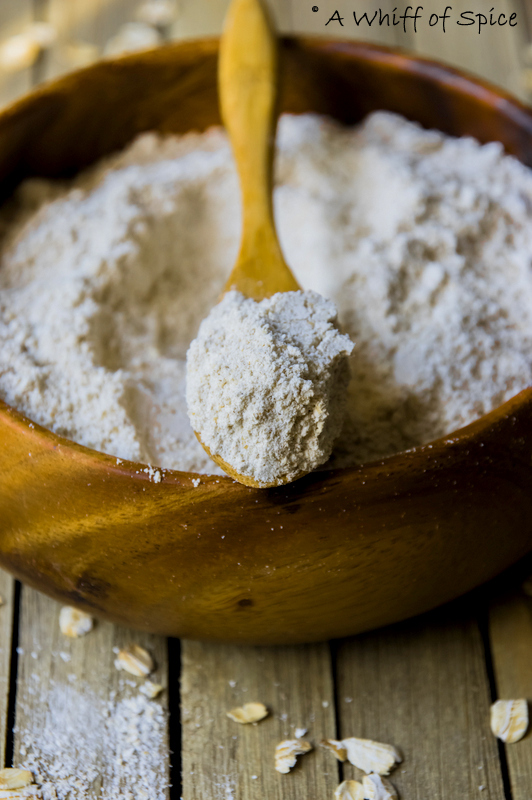 I have noticed that Wheat Flour, even the Whole Wheat, spikes my blood sugar, every single time. The high fiber and slow absorbing carbs in the Oat Flour, makes sure, I don't have a sugar spike. And I love the little dense texture and the toasty flavor, that Oat flour brings to baked goodies. Now that I can make this at home, I think I'm going to experiment more with Oat flour goodies. 1. 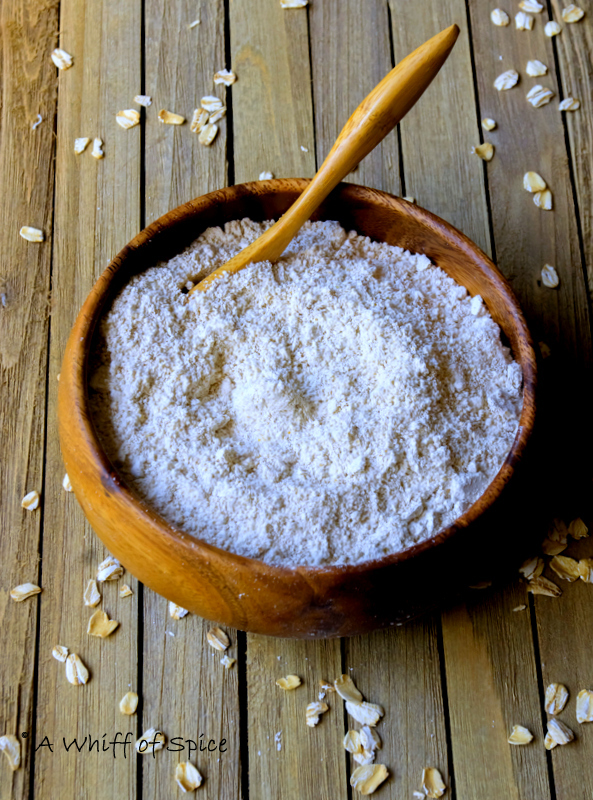 Add the Rolled, Quick or Old Fashioned Oats to the bowl of the food processor and pulse the oats until they are ground into a powder-like consistency. 2. Depending on the speed and power of your food processor, this process can take less than a minute to up to two minutes. 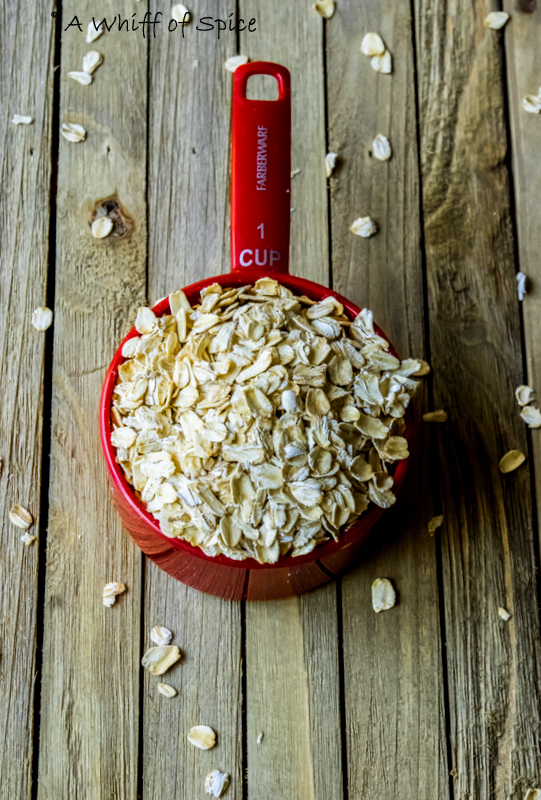 Stop and stir to ensure that all the oats have been finely ground. 3. One cup of Rolled, Quick or Old Fashioned Oats will yield approximately 1 cup of Oat Flour. Store unused portion in air tight container. Notes/Tip: For people with gluten intolerance, please make sure that the Oats are Certified Gluten Free. I had no idea that its actually possible for one to make their own oat flower. I am surprised that a post exhibiting such interesting content and has a wonderful outlook is not a widely read one. Thank you for sharing! Finally found a recipe for this flour.